In a recent post I wrote about one of my latest Minneapolis skyway food adventures. I still haven’t branched out as much as I had intended, but have had opportunities to try a few more restaurants. The skyway is a fascinating microcosm you might not know exists unless you work downtown. Many of the restaurants and cafes are only open Monday-Friday during daytime hours. This post serves as a running list of all of the foods I’ve tried from the Minneapolis skyway system. The sign outside advertises a lunch special that includes two dishes and appetizer for something like $6. You will have to specifically ask for this, otherwise you will receive a two-entree meal with a full order of an appetizer paying more like $9. The restaurant is busy at lunch, but the line moves quickly. Honestly, this wasn’t a favorite meal. The two particular dishes I chose (curry chicken and Thai chicken) were marked as spicy but tasted really mild and a bit bland. The Thai chicken sauce tasted sweeter than I expected and both entrees were chock full of onions. Maybe I would have loved some of the other dishes. However, I did really like the cream cheese wontons. The wrappers were light and crispy and contained a good amount of cream cheese filling. Allie’s Deli is always busy. There’s always a minor traffic jam between Allie’s and the sandwich shop across the hall. Signs boast it’s the home of “Create your own salad.” Is it really? Who knows, but it appears to be very popular. The line system is somewhat complicated for skyway dining. The one you stand in depends if you are ordering soup, a sandwich, or salads. Once your order’s ready, take it to the register to pay. Don’t let the lines stop you. Allie’s has the work-lunch down to an art and operates efficiently. I ordered a bowl of chicken wild rice soup for about $5 + tax. Allie’s offers a large variety of homemade soups each day. This chicken and wild rice soup is about as good as it gets. I’ve had worse versions from fancier restaurants. Allie’s also serves it with a generous side of fresh bread sprinkled with garlic seasoning. Food trucks park outside when the winter transitions to spring. There’s an intersection not far from where I work that I can easily pop down to the row of food trucks that park there. One afternoon I ordered samosas from Alimama’s. Two, big sambusas plus pita or salad costs $7. They’re freshly fried on this pot. Don’t forget to add little cups of the spicy green sauce. This business just won Citypage’s “Best Kept Secret” award. Alimama’s actually operates a lunch counter inside Metro State University and serves other Somali dishes. I come here from time to time. There’s a little Bogart’s kiosk in the middle of the IDS Center Crystal Court. This is one of my favorite places to sit for a moment on my lunch breaks. I can always find an open bench near the trickling fountain that drops from the ceiling to the floor. Bogart’s yeast raised doughnuts reminds me of Vincent Van Doughnut where I worked in St. Louis. The doughnuts are huge and delightfully fluffy, plus they’re scratch made. Bogart’s brioche dough is rich and soft to the bite, while Vincent’s is scented with more spices and a beignet-like chew. I loved the brown butter glaze and Nutella-stuffed doughnuts. The Nutella doughnut is jam-packed with Nutella. No complaints here. This cafe offers frozen yogurt, breakfast sandwiches, and doughnuts. Of the two tiers of doughnut shop price ranges ($1 vs. $2-4), Cafe Donuts lands in the less expensive. One week I bought a box to share with my coworkers. This was a perfectly serviceable old-fashioned. It didn’t change my world like World’s Fair’s buttermilk old-fashioned in St. Louis (something that I’m trying to accept, but fulfilled my doughnut craving. I come here somewhat frequently. My employment agency contact surprised me with a big bag of Candyland Chicago mix. My coworkers had just been talking about how much they liked Candyland’s popcorn, so it like serendipity. I think Candyland’s is as good as Garrett’s and I might even like it better. Usually I’m not that into caramel corn. I hate the sickly sweet, flat-tasting caramel corn. Candyland’s is really good. So good that I picked it all out from a partially filled bag which Jake found later. He looked crestfallen when I confessed to eating all of the caramel. “I thought you only liked the cheese!” he exclaimed. “But Candyland’s is really good!” It’s not going to break my heart to get another bag. I visit here somewhat frequently too. Cocoa & Fig’s skyway outpost is near the double-decker Walgreen’s with the sushi counter. The retail shop offers a selection of macarons, cupcakes, cookies, and some candies. For $1.50, you can purchase one of the best chocolate chip cookies ever. “Is that sea salt,” I hopefully asked the employee managing the bakery counter. “It is,” he confirmed, adding that the cookies are made with browned butter and Valrohna chocolate. The soft carrot cake sandwich cookies with cream cheese frosting are delicious too! Franks A Million is also located in the same food court as Shanghai Kitchen where I had that fantastic eggplant dish. The restaurant seems to be operated by one person who takes orders, cooks, and rings out customers. Burgers are cooked fresh, so expect a little bit of a wait. My California burger, fries, and bottle of water cost around $8. The fries were crisp and perfectly salted. A toasted bun would have pushed the burger from good to great. If you want cheese, don’t forget to add it to your order! This little pizza shop is located in theTCF Skyway. You can buy breakfast or lunch pizzas by the slice (or order by the whole). I ordered a simple lunch of one slice of cheese pizza ($2.60) and a side salad with ranch (2.69). The ranch tastes jarred, but the veggies in the salad was fresh. I thought this was a solid and sizable piece of cheese pizza. It didn’t change my life but scratched my cheese pizza itch. The people who work here are very welcoming and friendly. Kikugawa, located in the Northstar Center is one of my favorite. Sushi here is made fresh to order too. If I don’t order the cold noodle salad, I order an eel sushi roll ($6) and a fried spring roll ($1). The line’s never too long and the people who operate the restaurant are nice. I wish I had read Dara Moskowitz Grumdahl’s post about iGrill before I visited. The $4 veggie and $5 meat platters seem to good to be true. I randomly walked by iGrill over lunch and the signs advertising the platters caught my eye. I assumed that the $4 veggie platter came with rice and my choice of a veggie entree. That seems fair enough, right? As I moved through the line, I was confused when the man pointed at each dish and asked if I wanted a serving. I nodded at two of the veggie dishes, to which he added a generous serving of garlic naan. Turns out that you can enjoy scoops of all of the entrees they offer + the garlic naan, dessert & condiments for that $4 or $5 price. I am not sure if this is just a promotional price or if they will always be this low. Either way, it’s worth a visit. I found the dishes flavorful and perfectly seasoned. The seasoned rice and chickpeas carried a welcome touch of heat. Next time, I will try the meat platter. No photos, but I enjoyed some happy hour snacks and house wine. Happy hour goes until 9 p.m.! I especially liked the warm, soft pretzel sticks and cheese sauce. Last visited November 2018. Multiple locations. To be clear, I’ve never ordered a whole meal here. Last month I was really into bringing my own vegetables and hummus to work for lunch. Then, I’d walk over to Naf Naf and buy three falafels, pita bread, and dipping sauce for under $3. The freshly-baked pita here is really good. It’s puffy and soft with a homemade taste (not that stale, bagged pita taste). The falafel are freshly scooped into the fryer. I’m not sure if it’s this location, but they’re very crunchy, which I prefer. Usually I choose the creamy, salty tahini sauce. One day I branched out and tried the pickled mango sauce. I didn’t love the flavor and so I’ll stick with the tahini. There are five One Two Three Sushi locations in downtown Minneapolis and one in downtown St. Paul. The founders of this chain also own Masu. The theme is fast casual Japanese food including made-to-order sushi rolls, ramen, rice bowls, and steamed buns. Make your own sushi roll or choose one of their combos. Each day, the restaurant advertises a special roll for around $5. I tried the shrimp tempura buns with spicy mayo. I watched as the buns were steamed to order and breaded shrimp were placed in a special contraption that made them crispy in seconds. For about $8, the buns made a filling lunch. Next time, I’d add a more acidic sauce to break up all of the richness of the fried shrimp and mayo. There are a few thing that make Orient Express unique: They frequently post their daily lunch specials on their Facebook page, they offer whole roasted duck and crispy pork belly by the pound, and occasionally offer samples of honey chicken to people passing by in the skyway. For less than $7, you can purchase a two entree combo. This serving of honey chicken and garlic vegetables was so generous, I took half home for a second meal. Everything tasted fresh and service was friendly. Will definitely return to try more of the menu. Roti is actually a chain with locations in six other states, most densely concentrated in Illinois. The only Minnesota location moved into the IDS Center about a year ago. If you are expecting cuisine centered around the Indian flatbread, roti, you might be kind of disappointed. If you are interested in a Mediterranean-style Chipotle, this might be your jam. Pick a bowl, pita sandwich, wrap or salad, your choice of protein, and as many garnishments and sauces as you’d like. 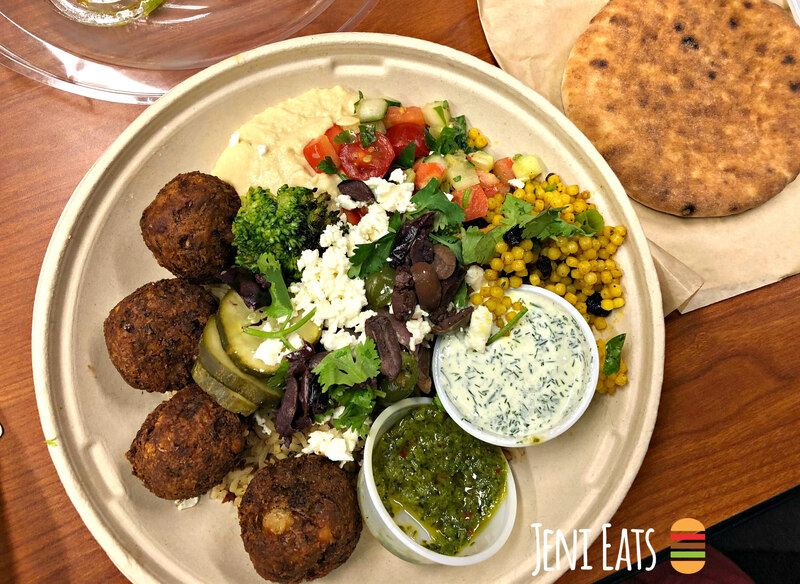 I ordered a falafel rice plate with couscous, hummus, tomato & cucumber, fresh veggies, olives, feta, lemon-oregano pickles and fresh cilantro with yogurt sauce and green spicy sauce. The falafel taste like they’re homemade. They aren’t the dense, crunchy type but softer on the inside. Overall, I found the portion size very generous. I’m not sure about the sandwiches and wraps, but the salads and rice plates come with a little round of soft pita. You can really load the rice plates and salads with all of the toppings (there were several I left out). All of the veggies and sauces tasted fresh. The hummus was delicious. The heat lovers didn’t find the spicy sauces super spicy but they tasted good. I love the concept. For under $10, this was a satisfying meal. If there was a Roti closer to home, I’d stop by from time to time for dinner. Shanghai Kitchen is located in a little food court near Blackeye Roasting and The Crossing Building. The food looks really fresh. You’ll find more options than what you might find at a typical Chinese take-out restaurant. The Teahouse sold this location to new ownership in 2014. The sesame chicken looks crispy and glistens. I also eyed the ma-po tofu and a spicy pork dish nestled in a chili-saturated sauce. $8 plus some change got me a generously loaded two item combo with a side of cream cheese wontons. I chose silky eggplant and a spicy chicken dish, all of which tasted delicious. Plenty leftover for a second meal. On return visit, I ordered the udon noodle bowl for $8. This bowl takes a moment to prepare. It’s full of fresh vegetables, chewy udon noodles, fresh-tasting shrimp, and a hardboiled egg. Ask for extra chili sauce. At the end of a stressful week, this meal made me feel so nourished. Side note – the man in front of me was raving about the braised pork bowl to his friend with so much passion I made a mental note to try it. This small take-away shop sells local and organic foods. There’s often a small table out front sampling coffee or a salad. Inside you’ll find all types of snacks, sandwiches, salads, beverages, and a hot soup bar. There’s even kombucha on tap. I ladled myself a bowl of vegetarian wild rice soup and grabbed a small piece of bread. For 25 cents, you could add small pieces of bread (about the size of a quarter-roll) to your soup. When I paid my bill, I was surprised at the price which clocked in at over $7. “This soup better change my life,” I muttered to myself. The funny thing is that it did. This was a very good bowl of soup. Piping hot, perfectly seasoned and chock full of slivered almonds, lovingly hand-sliced carrots, and plump mushrooms. I’m still thinking about it. I love picking up fun bubbly waters in all types of flavors here. And of course, the magical soup. I am also a so good Asian. Recently, I’ve noticed the line here is oftentimes long. I stopped by to check it out. In addition to the hot food in the steam tables, there are bowls and soups you can order. I bought a two-item combo with fried rice, General Tso’s chicken and beef + broccoli for about $8. All in all the entrees tasted very good. The rice drier but, on the other hand, it wasn’t oily. Skyway Wok still blew me away with quality and quantity, but this is closer to my office and I would visit again. On this day I learned that the reason why the line is so long at Skyway Wok is because it’s really good. I thought I arrived early at 11:15 a.m. but the line snaked around the corner. 30-minutes later I was on my way back to the office, food in hand. The line moved slowly as the team tried to keep all of the dishes refreshed. It’s clear the food is made with care in smaller batches. No one seemed to bothered by the wait. They must have been here before. The amount of food I received for $7 was staggering (2 item combo + eggroll). I took half home. The orange chicken pieces were hand battered and freshly fried. And the sauce wasn’t the gloppy cloyingly sweet type but something lighter and spicer than you typically find. The broccoli in the beef and broccoli dish was fresh and tendercrisp. Skyway Wok’s egg rolls are huge. Twice as large as the typical egg roll. The outside has a crisp coating, as if it was dredged in cornstarch to give it extra crisp; the inside’s stuffed with a meat-vermicelli noodle filling. The food here is so good, bountiful, and affordable that I’ m not sure I can easily be steered many other places when I want Chinese food at lunch. The line at Sushi Takatsu is always long. Although many friends have told me that it’s their favorite skyway restaurant, I’ve had to walk by many times because I just didn’t have enough time to wait. If you arrive closer to opening, or work nearby and have an hour lunch, you’ll be fine. The prices here are unreal. For $7, the restaurant offers a sushi bowl lunch special that consists of a bowl of rice topped with spicy tuna, salmon & yellow tail, avocado, spicy mayo and eel sauce and crunchy tempura flakes, PLUS a bowl of miso soup. This is the most fantastic deal I’ve seen in the Skyway so far. Not just because of the price, but because it tastes so good. I have no idea how Takatsu delivers this quality of food at these prices. This large box of sushi cost $10 before tax and tip. Considering what I’ve paid at grocery stores for grab and go sushi, this cost so less and tasted very fresh. The rolls were generously filled with salmon and tuna that maintained a firm texture. The sweetest words one could ever hear at work are “I have an extra taco, do you want it?” Obviously I said yes. I’ve walked by Vellee countless times and never visited – it’s usually busy and I was afraid of paying for overpriced Asian fusian food. I am happy to say that I really like this pork taco just as my coworker said I would. The pork reminds me of the kind you might find in a bahn mi. A sesame oil scent perfumed my cubicle. She ordered the first spice level which provided a pleasant kick. One taco was quite filling. I especially liked the abundance of tangy slaw and pickled vegetables. A filling and fresh meal. Feel free to share your favorite Minneapolis skyway meals and snacks below. 9 pm happy hour?! sign me up!! You had me at donuts and sold me at cheese and warm pretzels! I think I need to visit the skyway. Such a good idea for a post! I wish I would have had this before I spent weeks downtown for training! Will definitely share with my friends who work in or by the skyway!